Chocolates and Raspberries are match made in heaven. This red-berry is sinfully delicious and elegantly presented dessert will melt in your mouth. Silken tofu is an excellent guiltless alternative to the heavy cream used in making the classic filling. Smooth, creamy and rich texture is truly divine with its enticing taste. A tart is a sweet or savory dish with only a bottom crust. Usually a pastry dough is used to get a firm and crumbly crust. I have replaced the meticulous traditional way of making the base with flavorful Belvita made with ease. Be well assured this souped up version is simple as using Graham crackers with no compromise with its rich flavor. Indeed, it tastes way better with its cinnamon and brown sugar flavor. 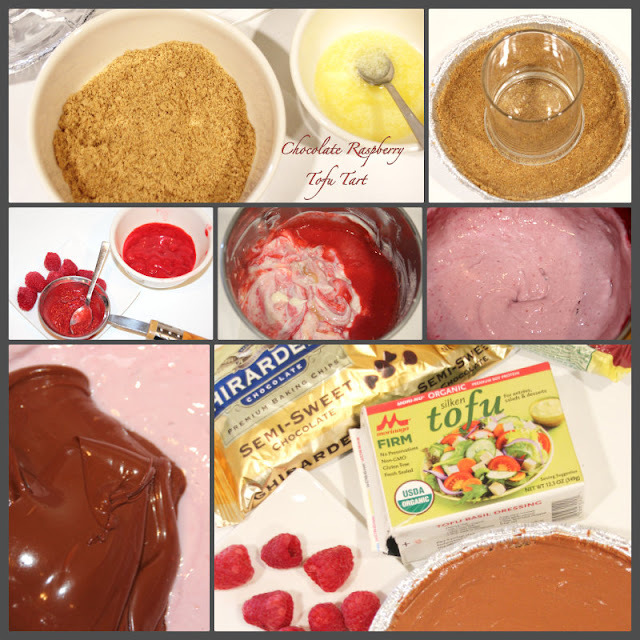 The raspberry and chocolate overpowers with its flavor leaving tofu as a secret ingredient. Nevertheless, the silky texture is obtained from the tofu itself. The Belvita crust along with the silky chocolaty raspberry and the sauce goes very well together that tastes heavenly. Decorate this decadent dessert with chocolate, raspberries, nectarous pecans and edible flowers or as you like. Enjoy! You might also be interested in my 'Belvita Blueberry Pie', a similar dessert. Preheat oven to 325 degrees F (165 degrees C), although baking can be eliminated. Please check note for details. 1. Crumble the biscuits in a blender until fine crumbs. 2. Coat the pie pan with cooking spray or melted butter on the bottom and sides to remove the crust easily after baking. 3. Mix the crumbs with the melted butter. To check for the right consistency, you should be able to make a rough ball when compressed. 4. Now spread the crust mixture evenly flattening on the bottom and up the sides of the pie pan. Press firmly using the bottom of a flat glass and set aside. 1. Puree all the raspberries in a blender and run it through a sieve to remove the seeds. Use 1 cup for the filling and save 1/2 cup pureed raspberries for the sauce. 2. Process the tofu in the same blender until smooth. 3. Microwave the chocolate chips in a microwave safe bowl for about a minute. Stir well and add to the tofu. 4. Add honey, vanilla essence and 1 cup of pureed raspberries and blend everything together until a smooth mixture. 5. Now, pour the filling in the prepared crust pan and refrigerate for 2-3 hours minimum to set. 6. Disposable pie pan works like a gem to transfer the tart from the pan easily. Run a clean knife along the edges to separate the tart from the pan. Make a small cut on the edge to peel the pan off to retain the shape. Add all the sauce ingredients (1/2 cup pureed raspberries, sugar and water) in a sauce pan and bring it to a boil. Simmer for few extra minutes to get the right consistency. Once done turn the heat off and set aside. The topping gets thicker like a syrup consistency as it cools down. Serve with warm sauce and decorate with fresh berries, chocolate, or honeyed/ caramelized nuts. Shelf-stable firm Silken Tofu package seems to work better than regular refrigerated tofu given the texture. Please check Belvita Blueberry Pie "Notes and Tips" to wash and store fresh berries. Only the crust is baked for the crunchy crust to set well to prevent crumbs. You may eliminate this baking step, but be careful while removing the tart from the pan to avoid too much crumbs.